Suzy Lamplugh House, SoloProtect’s UK Head Office in Sheffield, is also the northern training base for Suzy Lamplugh Trust to deliver training to clients. Suzy Lamplugh Trust delivers a range of personal safety and lone worker training courses, with the move allowing them easier venue provision when working with clients that are based in the region, or in easier reach than Suzy Lamplugh Trust’s London offices. Whilst based in the capital, Suzy Lamplugh Trust is a national charity, and is committed to campaigning, educating and supporting people to help reduce the risk of violence and aggression for everyone. The venue, which houses the bulk of SoloProtect’s UK operation, and the company’s EN 50518 approved Alarm Receiving Centre, was named in Suzy Lamplugh’s memory, and opened in September 2015. The facility helps SoloProtect deliver its range of lone worker safety solutions to clients across the UK – all current SoloProtect customers are also able to access a 10% discount on all training courses delivered by Suzy Lamplugh Trust. 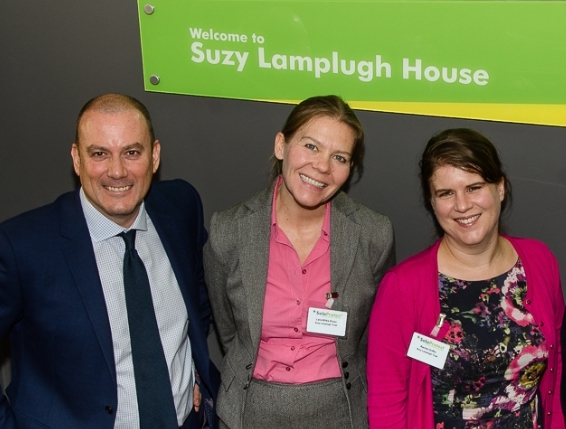 Pictured at the opening of Suzy Lamplugh House, from left to right: Craig Swallow, SoloProtect UK Managing Director, Lara Wilks-Sloan, Suzy Lamplugh Trust Commercial Manager, and Rachel Griffin, Suzy Lamplugh Trust Director. SoloProtect is an ongoing supporter of Suzy Lamplugh Trust. Suzy Lamplugh House is located just off Junction 34 of the M1 Motorway, close to Meadowhall, with excellent road and rail transport links. The building is open to use by the trust on an ongoing, free of charge basis. Suzy Lamplugh Trust is our nominated partner charity, and every lone worker device sold by SoloProtect directly benefits the trust.